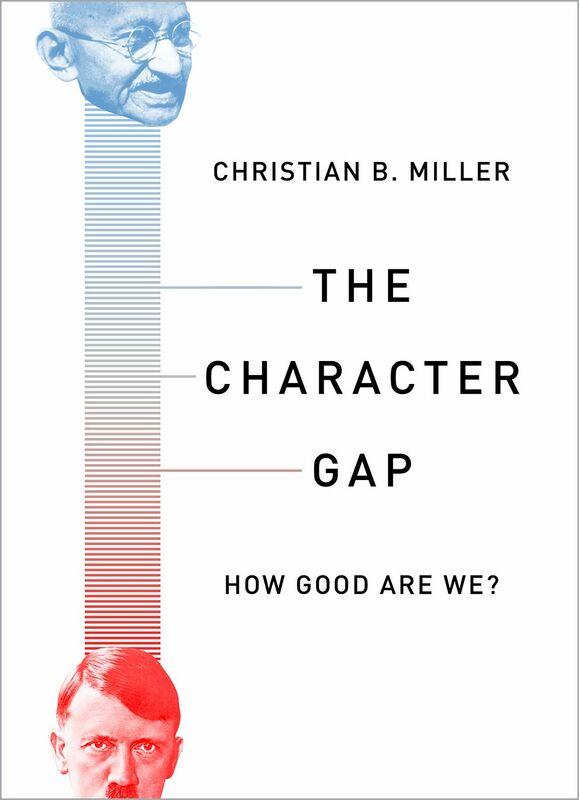 In his recent book, The Character Gap: How Good Are We?, Wake Forest philosophy professor Christian Miller demonstrates an important character trait: courage. He provides fascinating insight about human character by reporting on and interpreting psychological studies. This would make for an excellent book, but he doesn’t stop there: at the end he boldly offers Christian belief and practice as a key resource for character growth. Although the book is largely scientific, Mr. Miller, a Christian, openly advocates a religious approach to building virtue. When doing so, the man of reason and science gives way to the man of faith. I’ll return to Miller’s Christian conclusions at the end, but first, let’s digest the meat of the book, where he explores research on four human activities: helping, harming, lying, and cheating. It turns out our behavior can depend as much on our circumstances as on our character. Miller cites studies where participants encountered a person crying out in pain in another room. When paired with passive bystanders, subjects were far less likely to risk trying to help. If no one else thinks this is their problem, why should I? Likewise, when directed to administer electric shocks to another person, subjects were far more likely to inflict extreme pain when urged on by an authority figure. It seems we’re willing to harm others if we think someone else is ultimately responsible, hence concentration camps. Oxford University Press (2017). 296 pp. $21.95. We like to think of ourselves, our friends, and our families as decent people. Hundreds of recent studies in psychology tell a different story: that we all have serious character flaws that prevent us from being as good as we think we are—and that we do not even recognize that these flaws exist. But neither are most of us cruel or dishonest. Instead, Miller argues, we are a mixed bag. Miller explains this recent psychological literature to explain what the notion of ‘character’ really means today, and how we can use this new understanding to develop a character better in sync with the kind of people we want to be. On the positive side, we’re more likely to help others if we have recently experienced guilt or embarrassment—even the minor embarrassment of being asked to help as we emerge from a public bathroom. Miller concludes that our character is a mixed bag. We’re capable of good and evil, but our choices often arise as much from context as character. Miller’s treatment of lying and cheating is equally sobering. Studies reveal a high frequency of lying in the average person’s life, though our motivation for lying isn’t always self-serving, and might occasionally be truly altruistic. Once again, environmental factors can have a big influence. We’re less likely to cheat in the presence of something that reminds us of our moral commitments, like a wedding ring, a printed honor code, or a copy of the Ten Commandments. We’re also less likely to cheat on a test when seated in front of a mirror. Strangely, catching ourselves in the act of cheating seems to be a moral deterrent. We want to think well of ourselves, and physically watching ourselves cheat makes that hard. What Can We Do to Improve Our Character? After diagnosing the vicissitudes of our virtues and vices, Miller explores ways we might try to improve. He recommends finding moral role models, avoiding situations where we know we’ll be vulnerable to moral failure, and educating ourselves about the kinds of circumstances that might unconsciously affect our decision making. He then raises the possibility of divine assistance—specifically, Christian belief and practice. Miller notes the emphasis on character development in Christianity, the routines and rituals that reinforce good character, the encouragement of Christian community, and the help of the Holy Spirit. Is there empirical support for the idea that Christian practice enhances character? Yes. Miller cites studies that correlate regular church attendance with around 50 percent lower levels of domestic violence, 350 percent higher levels of donations to charity, and 200 percent higher levels of volunteering. He also notes that religious people are far more likely to donate blood, help the homeless, and express empathy for those less fortunate. These aren’t cherry-picked examples, as per Julian Baggini’s critique. Rather, Miller observes that there are “literally hundreds of studies” that correlate weekly religious attendance with positive behaviors, ranging from not selling drugs to acting altruistically. While he’s careful not to over-attribute causation, Miller’s case is compelling. He also takes time to address the wrongs done in the name of Christianity and whether these can be said to cancel out the apparent ethical goods that spring from Christian practice. While Miller shows true courage in his inclusion of a specifically Christian frame for the book, there are two limitations to the project. First, concerned not to alienate the non-religious, Miller works perhaps too hard to list Jesus among other moral examples. Indeed, there’s a risk that less careful readers might miss the central point of the Christian message: the radical intervention of our sinless Savior to rescue us from sin once and for all, not just to give us a moral example. Second, the book does little to highlight the need for an underlying philosophical foundation for morality. Take the instance of a suicide bomber. We may evaluate his or her actions as a vicious attempt to cause harm to others. But according to his or her own moral code, this might be a great act of courage and self-sacrifice. I empathize with Miller’s desire to bring his non-Christian readers with him, but it would be possible to read this book without realizing the deeply contested ground on which all moral categories rest, and the need for a universal framework to sustain any moral evaluation. I highly recommend reading The Character Gap. You’ll learn things about yourself and others, and it’ll help you notice your own moral cowardice in the face of peer pressure and fight against it. Buy a copy. Give one to a friend. Then meet with them to fill in the gaps. Like you, they need a Savior, not a coach.